Rodgers revealed Tuesday that he played with a tibial plateau fracture in addition to an MCL sprain during the 2018 season, Rob Demovsky of ESPN.com reports. Rodgers said his troublesome left knee is feeling good and shouldn't have any impact on his offseason routine, Rob Demovsky of ESPN.com reports. 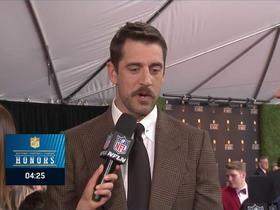 Rodgers (concussion) said at the NFL Honors event Saturday that he has no lingering injury concerns, Lindsey Pallares of WBAY Sports reports. Rodgers (concussion) has been ruled out of the 2019 Pro Bowl. Rodgers has been diagnosed with a concussion and won't return to Sunday's game versus the Lions. Rodgers left Sunday's game against the Lions to be evaluated for a concussion. Analysis: If Rodgers is diagnosed with a concussion, it would be a fitting end to what has been a lost season in Green Bay. Fortunately for the quarterback, there won't be any meaningful game action for many months, so he would have plenty of time to recover. DeShone Kizer will fill in at QB for as long as Rodgers is sidelined. Rodgers (groin/knee) completed 37 of 55 passes for 442 yards and two touchdowns while adding 32 yards and two touchdowns on five carries and running in a two-point conversion in Sunday's 44-38 overtime win over the Jets. Rodgers (groin/knee) expects to play in Sunday's road game against the Jets, Rob Demovsky of ESPN.com reports. "I want to be out there with the guys, and I look forward to being out there," Rodgers said Wednesday. Rodgers (groin) took the initial reps during the portion of Wednesday's practice open to the media, Rob Demovsky of ESPN.com reports. Analysis: Rodgers' Week 16 availability against the Jets is in question due to a groin injury suffered in Sunday's 24-17 loss in Chicago. If he has his way, Rodgers expects to continue leading the Packers offense for the final two games of the season, despite having no chance at a postseason appearance. That said, interim coach Joe Philbin told Ryan Wood of the Green Bay Press-Gazette earlier Wednesday the team will evaluate Rodgers all week before coming to a decision. Interim coach Joe Philbin relayed that he's "hopeful" Rodgers (groin) will practice Wednesday and added that the Packers would take the full week to decide if the quarterback will play Sunday against the Jets, Ryan Wood of the Green Bay Press-Gazette reports. Head coach Joe Philbin relayed Monday that he has no plans to shut down Rodgers (groin) for the final two weeks of the season, Rob Demovsky of ESPN reports. "I think when you sign up for the 2018 NFL season, you sign up for a 16-game season and hopefully you earn the opportunity to extend that and to compete for a championship," said Philbin. "Obviously, the extension part is over. That being said, you're a football player, you're part of a team and your one role is to the contribute to the overall success of the team." Coach Joe Philbin didn't provide detail on Rodgers' groin injury Monday, the Packers' official site reports. Analysis: After Sunday's 24-17 defeat in Chicago, Rodgers told Michael Cohen of The Athletic that he tweaked his groin on a last-second Hail Mary heave at the end of the first half. Rodgers intends to play out the string of a season that won't include a playoff appearance for a second consecutive year, but the injury could cause the Packers to exercise caution with their $134-million dollar man. DeShone Kizer would be the next quarterback up if Rodgers misses any time, whether it's in practice or a game. 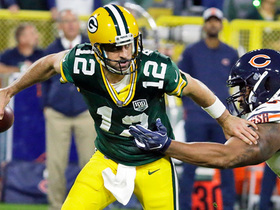 Rodgers said his groin tightened up during Sunday's 24-14 defeat at Chicago, Michael Cohen of The Athletic reports. "I'd like to be out there and lead us the last two weeks," Rodgers told Cohen in the post-game media session. Rodgers completed 24 of 42 passes for 274 yards and an interception during Sunday's 24-17 loss to Chicago. He added 25 yards on three carries. Rodgers completed 21 of 32 passes for 196 yards and two touchdowns while adding three carries for 44 yards in Sunday's win over the Falcons. Rodgers completed 31 of 50 passes for 233 yards and a touchdown while adding 20 yards on three scrambles in Sunday's 20-17 loss to the Cardinals. Analysis: Rodgers' lone touchdown was a 13-yard strike to favorite receiver Davante Adams in the second quarter. The quarterback showed a lot of heart by leading a fourth-quarter touchdown drive to tie the game 17-17 and then putting his team in position to kick a game-tying, 49-yard field goal as time expired (Mason Crosby missed the kick). While Rodgers hasn't lived up to his usual lofty standards this season, the sky's the limit for him in Week 14, when a vulnerable Falcons defense comes to town. Rodgers completed 17 of 28 pass attempts for 198 yards and a touchdown in Sunday's 24-17 loss to the Vikings. 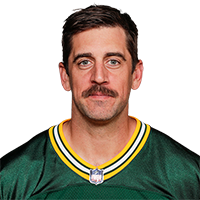 Rodgers completed 21 of 30 passes for 332 yards with two touchdowns and no interceptions in the Packers' 27-24 loss to the Seahawks on Thursday. He also rushed once for three yards. 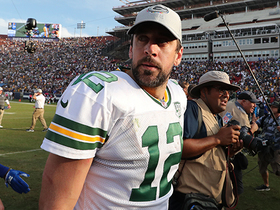 Rodgers (knee) practiced in full Tuesday, Ryan Wood of the Green Bay Press-Gazette reports. Analysis: In the portion of Tuesday's session open to the media, Rodgers was in a helmet, per Wes Hodkiewicz of the Packers' official site, forecasting his eventual activity level. Rodgers now will turn his entire focus to Thursday's road game against a Seahawks defense that has given up 285.3 passing yards per game and six touchdowns to quarterbacks over the last three contests. 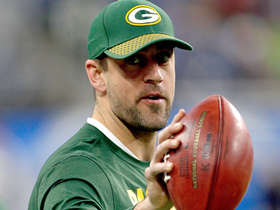 Rodgers (knee) was spotted doing some work during the team's short practice Tuesday, Rob Demovsky of ESPN.com reports. Analysis: After handling all practice reps last week, Rodgers might've raised some concern as a non-participant for practice Monday. 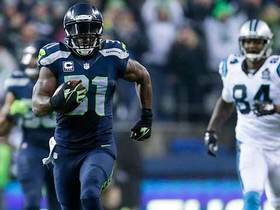 The absence may have just been a day off for maintenance, though, and he's back on track at practice ahead of Thursday's showdown with the Seahawks in Seattle. Rodgers (knee) was listed as a non-participant on Monday's estimated injury report, Tom Silverstein of the Milwaukee Journal Sentinel reports. Rodgers completed 19 of 28 pass attempts for 199 yards and two touchdowns during Sunday's 31-12 win over the Dolphins. Rodgers completed 24 of 43 pass attempts for 259 yards and two touchdowns in Sunday's 31-17 loss to New England. 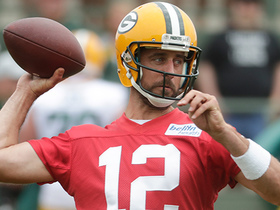 Rodgers (knee) practiced in full Thursday, the Packers' official site reports. Green Bay Packers quarterback Aaron Rodgers reveals his tibia, MCL injuries in 2018. Green Bay Packers quarterback Aaron Rodgers responds to the Bleacher Report article about him and former head coach Mike McCarthy in a radio interview. 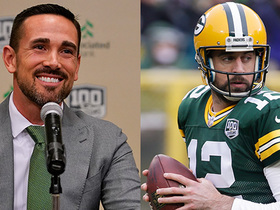 NFL Network Insider Ian Rapoport explains why he believes the recent Bleacher Report article about former head coach Mike McCarthy could actually help head coach Matt LaFleur and quarterback Aaron Rodgers moving forward. Green Bay Packers quarterback Aaron Rodgers talks the team's new coordinators, locker room cohesion, and hints at his upcoming contract. NFL Network Insider Ian Rapoport brings the latest information on the contract negotiations between the Packers and QB Aaron Rodgers. NFL Network's Mike Garafolo brings the latest information on the contract negotiations between the Packers and QB Aaron Rodgers. 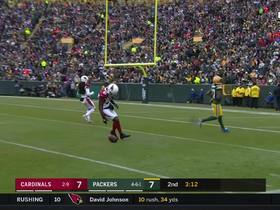 Green Bay Packers quarterback throws incomplete pass to wide receiver Davante Adams. NFL Network's Kay Adams and Kyle Brandt catch up with Green Bay Packers quarterback Aaron Rodgers to talk about his team's 2018 season, offseason recovery and more. 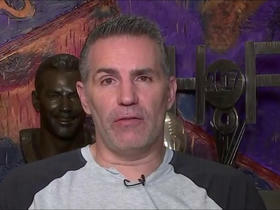 NFL Network's Kurt Warner talks about what the relationship will be between Green Bay Packers head coach Matt LaFleur and quarterback Aaron Rodgers.